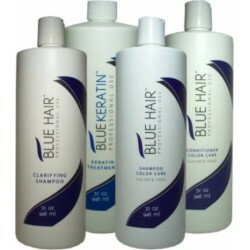 Blue Hair Keratin - Just Beauty Products, Inc.
Blue Hair Keratin There are 23 products. 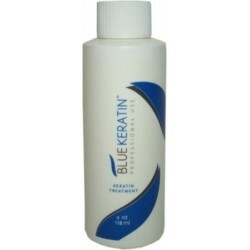 Blue Keratin reinstates, regenerates and straightens hair providing volume reduction, eliminating the frizz and restoring the capillar fibres. 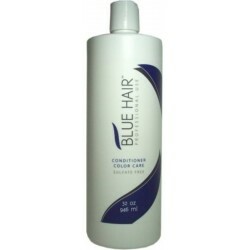 If using Blue Hair Conditioner and Shampoo Color Care for maintenance your keratin Smoothing treatment will last for Up to 4 months. 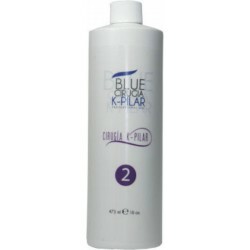 Blue Keratin reinstates, regenerates and straightens hair providing volume reduction, eliminating the frizz and restoring the capillar fibres. 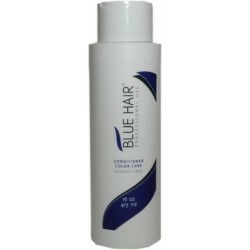 If using Blue Hair Conditioner and Shampoo Color Care as maintenance your keratin Smoothing treatment will last for Up to 4 months. 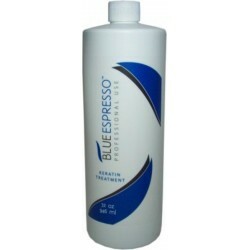 Blue Expresso Keratin Smoothing Treatment 32 oz. 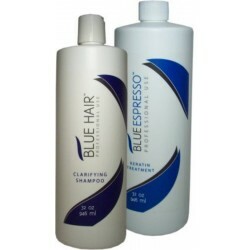 Blue Espresso Keratin Treatment reinstates, regenerates and straightens hair providing volume reduction, eliminating the frizz and restoring the capillar fibres. To remove after Treatment. If using Blue Hair Conditioner and Shampoo Color Care as maintenance your keratin Smoothing treatment will last for Up to 4 months. Blue Expresso Keratin Smoothing Treatment 16 oz. An anti-residue shampoo used to open the hair's cuticle so that the treatment can penetrate deeply.Developed to completely remove residuals from cosmetics, chloride, mineral deposits and oily ingredients, getting the hair ready for the application of Blue Keratin Smoothing Treatment. The perfect conditioner for this treatment, to make your keratin treatment last longer and keep the shine and natural look you always dreamed of. Made with keratin and sodium chloride-free, vital to the maintenance of the hair. 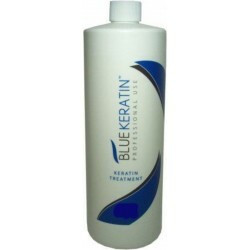 Blue Keratin Smoothing Keratin Treatment reinstates, regenerates and straightens hair providing volume reduction, eliminating the frizz and restoring the capillar fibres. 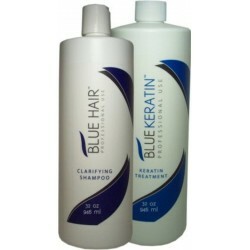 If using Blue Hair Conditioner and Shampoo Color Care for maintenance your keratin Smoothing treatment will last for Up to 4 months. 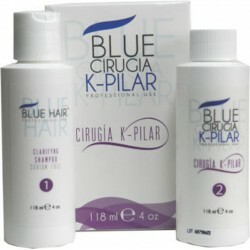 Blue Cirugia Kpilar restores nutrients lost in the hair. Blue Cirugia Kpilar regenerates and beautiful look. The components of vanilla and coffee provides a vast array of antioxidants and vitamins, contributing to hair repair as well as preventing future damage. 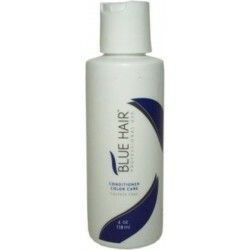 Hair becomes soft and easy to handle. 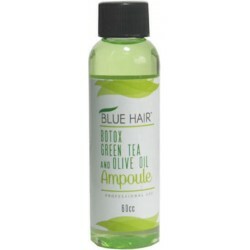 Blue Hair Botox Green Tea and Olive Oil Ampoule is a deep hydration treatment that produces smoothness, a gorgeous silky appearance and brilliant shine while simultaneously highlighting your natural or printed color. 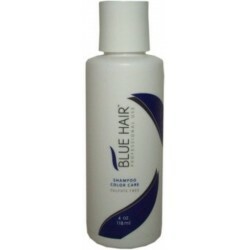 Blue Hair Argan Oil Leave-In Treatment is for all hair types. 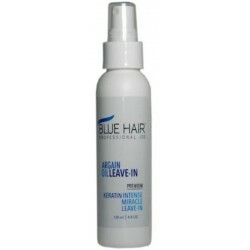 This Keratin Intense Miracle Leave-In is a natural Serum moisturizer rich in Vitamin E and Omega 3. 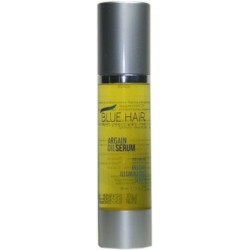 Blue Hair Premium Argan Oil Instant Illuminating Serum is a natural moisturizer rich in vitamin E and Omega 3. It has the unique quality of instant absorption into hair, creating an instant shine without leaving an oily residue. 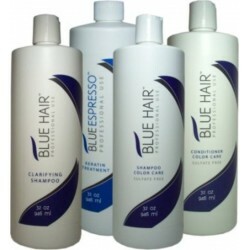 It is for all hair types.